"Applying Compassion in Business Management & Life"
A special program led by His Eminence Khedrupchen Rinpoche. Program will include Mindfulness Meditation, Loving Kindness mediatation and developing patience and compassion. Journey thru Bhutan, the Land of the Thunder Dragon with His Eminence Khedrupchen Rinpoche and learn how you can apply compassion to managing your business and life. Welcome to Bhutan, the Land of the Thunder Dragon. Touching down at Paro International Airport, you will be greeted by your guide upon exiting the arrival hall. Drive to Punakha to mee with Hi Eminence Khedrupchen Rinpoche for the briefing of the tour. Dochula Pass - At 3,050 meter, this beautiful pass located on the way to Punakha from Thimphu offers a stunning 360-degree panoramic view of Himalayas mountain range with its 108 chortens. Pho Chhu Suspension Bridge - The 160 metres Pho Chhu Suspension Bridge is known for the longest suspension bridge in Bhutan. Today we begin our spiritual journey from Punakha to Trongsa. Trongsa Museum (Taa Dzong) - Sits high above the valley at a strategic vantage point over Trongsa Dzong. The Tower of Trongsa tells the stories of the dzong and the valley that it has watched over for centuries. 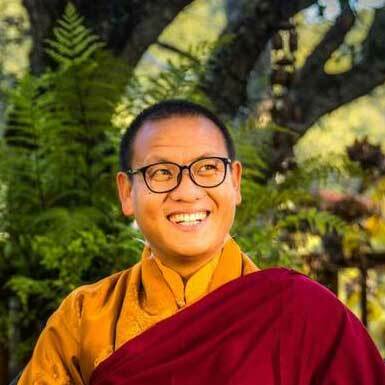 Life Lesson 1- Summary: A special program led by His Eminence Khedrupchen Rinpoche. Program will include Mindfulness Meditation, Loving Kindness meditation and developing patience and compassion. Summary: A special program led by His Eminence Khedrupchen Rinpoche. Program will include Mindfulness Meditation, Loving Kindness meditation and developing patience and compassion. Kuenga Rabten Palace - Kuenga Rabten Palace is 23 km from Trongsa Dzong. The road passes through open countryside high above a river gorge. Enjoy the drive as the terrain slopes quite gently opening opportunities for good bird watching and cultural sightseeing. Nabji Lhakhang - Nabji Lhakhang’s name means “taking an oath.” Long ago in this location King Sindha and King Nawoche took an oath of non-violence against each other in the presence of the great Indian guru, Padmasambhava (Guru Rinpoche). Kyichu Lhakhang- Also known as Kyerchu Temple or Lho Kyerchu, is the oldest temple in Bhutan. Just like Jambhay Lhakhang in Bumthang, it is one of the 108 temples built by the Tibetan King Songtsen Gampo to subdue and pin down an ogress that was obstructing the spread of Buddhism. Taktsang Monastery - Often called the Tiger’s Nest, perched on the cliffs, has awestruck many a visitor. “Trip to Bhutan is never complete without climbing to Taktsang”, says one tourist. Indeed, it’s true as the journey there fills you with spiritual bliss. For those not choosing the spiritual side, it is the dramatic, artistically built monument that becomes a hiker’s delight. Take a trip to this dramatically set Buddhist relic hanging from a cliff. Experience the uphill climb as you ascend more than two thousand feet from the valley floor. A prominent Himalayan Buddhist sacred site and temple complex located on the cliff side of Paro Valley. According to legends, it is believed that Guru Rinpoche flew to this location from Tibet on the back of a Tigress (his consort Yeshey Tshogyal) and meditated in one of the caves. Guru Rinpoche performed meditation and emerged in eight manifestations, and the place became holy, thus gaining the name Tiger's Nest. Remarks [0 hrs] - Seasonal attractions are subject to change due to weather conditions. The sequence of itinerary is subject to change without prior notice. If a place of visit is closed to visitors, it will be replaced with an alternative. During major events, accommodation may not be in the city mentioned. One traditional costume set – Gho / Kira – for use throughout your stay in Bhutan. To be returned to the guide on the last day of the tour. All the flight sectors in a Passenger’s Ticket must be used in sequence from the initial place of departure as shown on the Ticket. A down-payment of 50% is required to proceed with the booking. Full payment should be completed 30 days before departure. More than 45 days before start of programme, SGD 200 flat rate per person. No refund for special promotion tickets. There is a SGD 100 administration fee on each ticket cancelled.